When it came to choosing a restaurant to visit on my birthday at the end of September, it didn’t take me very long at all to settle on Launceston Place. A great experience there earlier in the year, together with very reasonable prices for what’s on offer, made it a no brainer. I was joined by friend, Chaundra, who shares my birthday, and husband Pete. There’s something wonderfully decadent about going out for a blow out lunch on the day itself, especially when it’s a weekday. So it took very little mutual encouragement for us to opt for the Tasting Menu, at £58 per person. 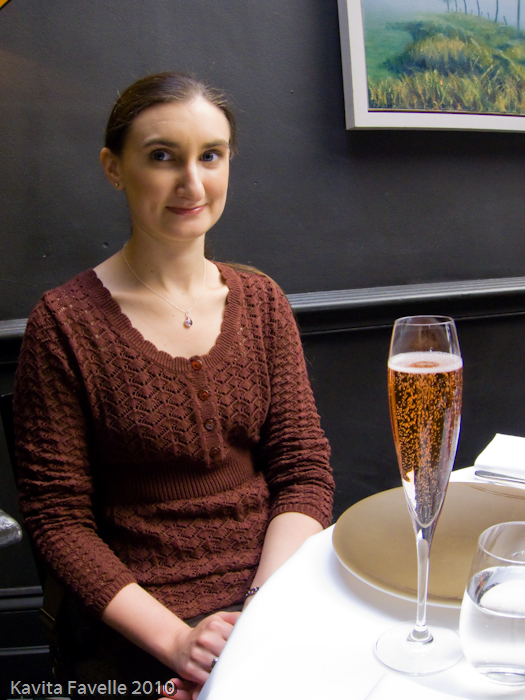 Once seated, we ordered drinks – a Kir Royal, a glass of Tokaji Aszu and, er… still water. Don’t worry, that last one wasn’t for either of the birthday girls (and we did try and persuade him to have some wine or beer instead). And then the parade of deliciousness started. Crisps. 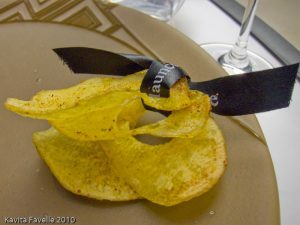 With holes in so they could tie them into portions with their trademark black ribbon. Fresh brown bread came with home made salted butter and a jar of pickled herring. I had planned not to eat too much bread but it was impossible to resist. I adored the herring pieces too. 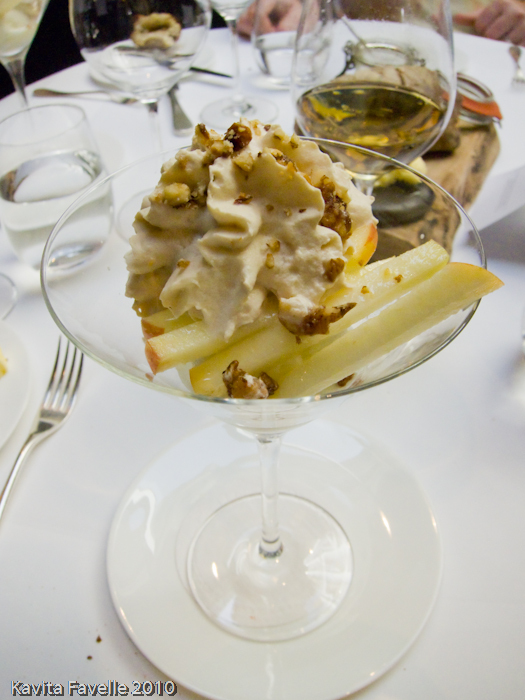 The amuse bouche was based on a Waldorf salad – walnut mousse, celery sorbet and long thin slices of sweet, fresh apple; a rich yet refreshing take on a classic. 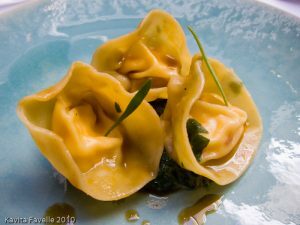 The native lobster parcels, oyster sauce and sea herbs was a beautiful dish – vivid orange pasta served on pale blue plates. The pasta was light, much lighter than it looks in my photograph. The filling was more pureed than I would have preferred; the reassuring hint of chew of larger lobster pieces was absent. But the flavours were seductive. It was gone far too quickly. We were all utterly bowled over by the truffled duck egg on toast, smoked duck and wild herbs. I would not have expected such an exquisite marriage between earthy truffle, smoked duck meat and the perfectly (slow) cooked duck egg and accompanying sauces. This was really, really, really, really good. And I don’t even normally understand the fuss over truffles, usually preferring the humble mushroom instead. The fish course was a baked lemon sole with brown butter, coastline vegetables and early potatoes. Again, there was the presence of sea herbs, a motif that appeared in several dishes. Pretty much anything is improved by a liberal slosh of warm, melted brown butter, right? 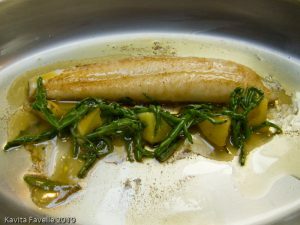 And the sole was already superb – deftly cooked to soft but not mushy. The samphire and potatoes balanced well. For mains, we had a choice. I went for suckling pig crubeens, pea, ham and crackling. Oh my! Tristan later explained that the crubeen was made from both pigs head and trotters. These oft-overlooked cuts (though less so these days) were transformed into an incredibly rich and decadent patty packing a powerful porky punch! (Sorry, I know – too much alliteration, very childish, but I couldn’t resist). On top was a slice of roast pork and crackling with the same chewy crunchy texture I so enjoyed previously. Very, very rich, this dish but awfully good. 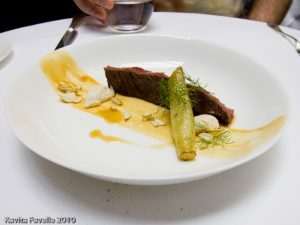 The other choice of main was rose veal onglet, cobnuts and wild fennel which was another delight. 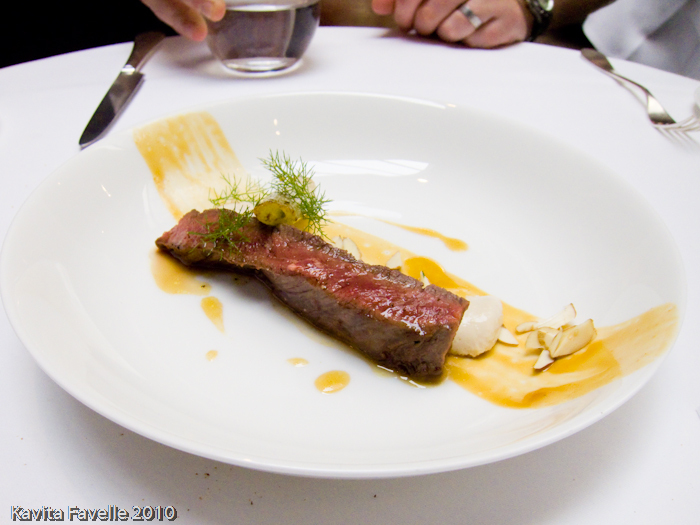 I would never – not in a million years – have thought to pair hazelnuts with veal or beef! 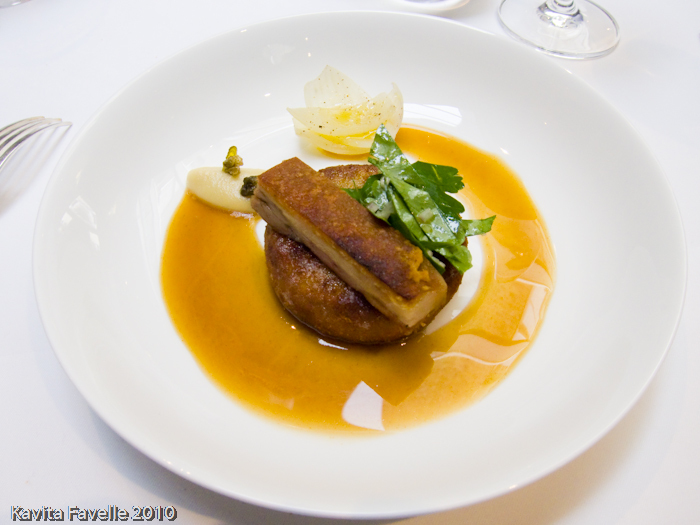 And yet, I loved the sweet nutty flavour against the rich, protein umami of the veal. The meat was absolutely excellent – all the wonderful flavour of the cut, one I’ve loved for many years, wonderfully tender and perfectly cooked. Oh look, a cheese board. But, hang on a second, the tasting menu doesn’t include a cheese course. 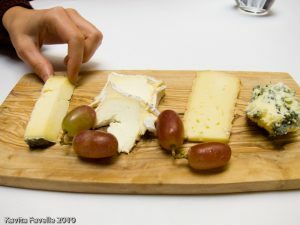 Well, the one stumbling block to us choosing the tasting menu had been the lack of a cheese course, though we agreed we could live without the cheese given the temptation of the rest of the menu. Having just finished our mains, I commented to Chaundra that our perceived downside of the tasting menu wasn’t quite such a downside after all, given that we still had courses to come! What I didn’t realise was that a member of staff was behind me and heard my comment about cheese. He decided that, full or not, we really ought to have a cheese course inserted into our feast and kindly served us the selection above. We munched our way through Yarg, Finn, Adrahan and Stilton. Delicious! 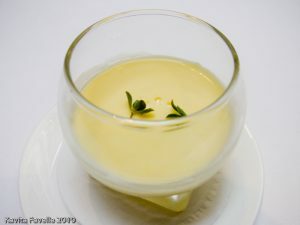 So, extra cheese course over, we moved on to darling little pots of lemon posset. 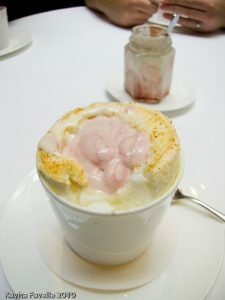 So very good – perfectly balanced between sweet and sharp with a wonderful creamy texture. Even as full as I was, I could have eaten ten of these! 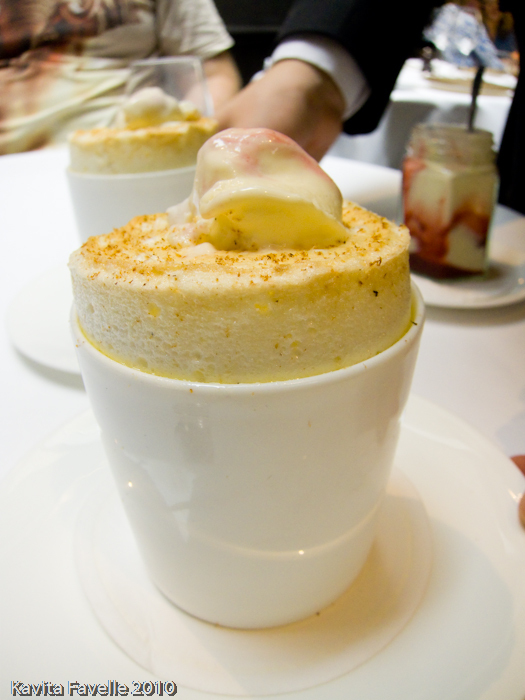 A Tristan Welch special, dessert of rice pudding soufflé with raspberry ripple ice cream was quite a spectacle. The ice cream came to the table in a jam jar and was dolloped into each soufflé by our waiter before they were placed before us. I hadn’t been able to imagine how one might combine rice pudding and soufflé but rather liked the clever way in which rice had been suspended into the light egg mix. The flavour of the soufflé was fairly plain which was perfect against the raspberry ripple ice cream. Pete, not a fan of rice pudding anyway, said he’d definitely have preferred the soufflé without the rice, but I rather liked it myself. After the dessert, just as we were congratulating ourselves on having made it through the whole menu without exploding, out came two darling red velvet cupcakes on tiny individual cake stands, each with a candle inserted, one each for Chaundra and I. They were so unexpected that I failed completely to take a photo but duly blew out my candle, made a secret wish and then wondered how on earth I might do justice to another dessert. Luckily, the ever-alert staff were on hand to offer us boxes in which we could take home our lovely little cakes to enjoy later. Thank you, LP, for this very kind gesture. We both appreciated it! Yes, once again, we thought the magnificent meal was over, only to be served with freshly baked petites madeleines with vanilla cream. I managed just half of one before I had to admit defeat but don’t worry, they didn’t go to waste… see those eager fingers? After our meal, we had a brief kitchen visit, where we were able to thank to team in person. They asked which our favourite dishes were, and whilst it’s hard not to just say all of it, we were all in agreement about the truffled duck egg being one of the highlights. We also enjoyed a quick chat with Tristan during which we could ask a few questions about the wonderful menu and thank him and the team for the kind birthday cupcakes. 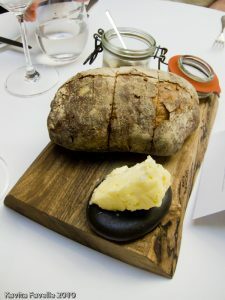 Whilst £90 per head (including service) may seem a lot to spend on a meal, it was a truly fabulous experience, one which we enjoyed every moment of and would not hesitate to recommend. 21 Comments to "Birthday Blow Out at Launceston Place"
Still one of my favourite restaurants ever. You go to such lovely places. That's one of the few things I miss about leaving the UK! Meems, forgot to take photos but they were red velvet cupcakes. Pretty! 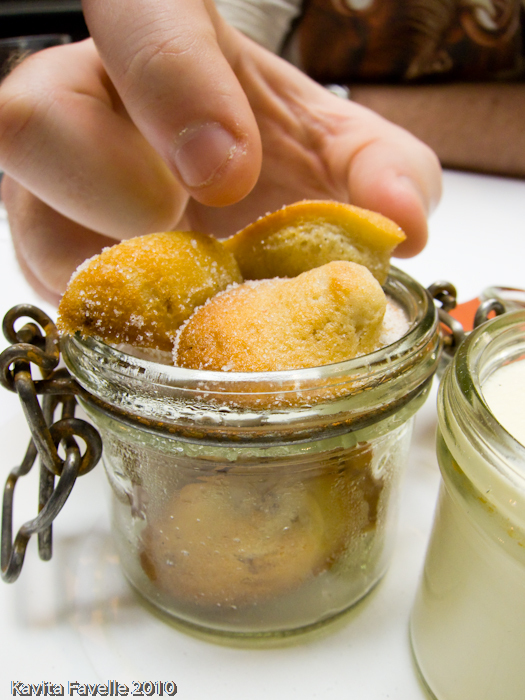 Debs, there are so many wonderful places in London right now, it's definitely a foodie's paradise! Glad you enjoyed your birthday meal – sounds like a great occasion. But isn't a bit of childish (your words not mine) alliteration fun. Nice post and a reminder I need to get back there soon. 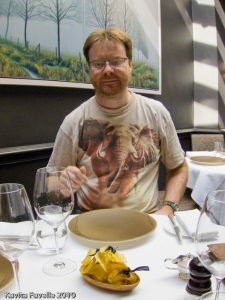 The Chef's Office at Launceston Place is one of my fondest food memories of the last two, three years. Lovely bunch of chaps too. One of those places I'm always happy to recommend to people. Kavey, I am dying of envy! After seeing Tristan (I think of him on a first-name basis!) on the telly in that competition last year, and eating tiny morsels of his food at the Olympia festival (coming up on Friday), I can only HOPE to go to the restaurant. 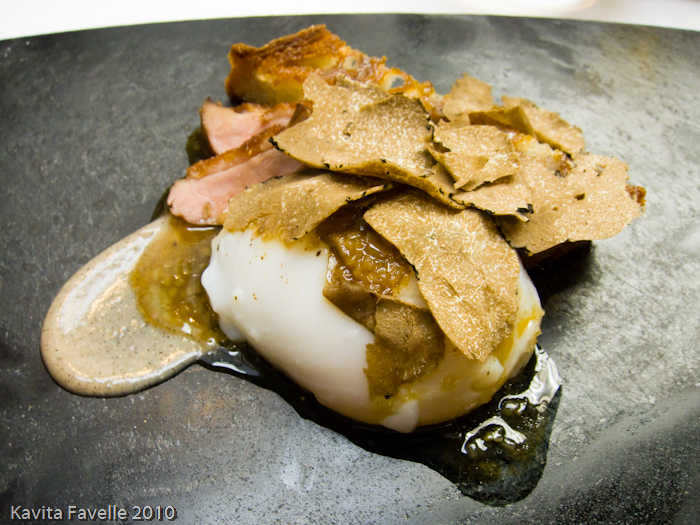 Truffles, duck eggs, crispy pork… how wonderful! Thank you for sharing your experiences. And, he's cute as a button too, is he not?! Kristen, yes he certainly is cute, I agree! Would definitely recommend a visit. 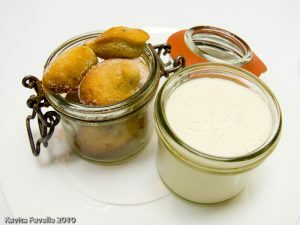 I think their weekday lunch set menu is a steal and even this tasting menu was great great value for what we had! What a stunning meal, Kavey! Launceston Place has been on my radar screen since I saw Steve Groves win Masterchef a while back, but after reading this review I think I *have* to go sooner rather than later. Love the fact that they served you a cheese course after overhearing you – that's such classy service. “Tristan later explained” – excellent early name dropping to encourage me to read every single word! 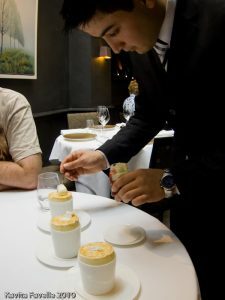 (I have a teensy crush on Tristan from his appearances on great british menu). Happy Birthday! And what a meal. Definitely one to bookmark for when this austerity thing is over. Foodycat, didn't mean to name drop at all, I met Tristan through Meemalee, and I think she also mentioned to him about us coming! I have been to Launceston Place twice now and really loved it both times – such a brilliant restaurant. Sounds like it was a really special meal. GC, it was the perfect celebration lunch, indeed! That looks absolutely sensational. I've been meaning to go to Launceston Place for ages – they do a good set lunch menu, so I'll have to give that a burl soon. Nice to see you celebrated in such style. lobster parcels, truffled duck egg, crubeens + rice pudding souffle… oh my! it's only been a few weeks since I lunched there but your post makes me want to head right on back! GT, as did yours when it went up! heh! Celia, it was fabulous and yes, presentation was as good as the tastes! They were very kind and service was excellent. Happy belated birthday! I've never been for dinner but lunch is still a good deal at LP! The lobster parcels and truffled duck egg look and sound utterly delicious. Have only had the chance to sample Tristan Welch's food at Taste of London (which wasn't all that impressive). Good to know L.P. is dishing up such quality! Thanks for the post and will make it a pt to visit sometime soon myself. Su-Lin, yes lunch is a great deal indeed and thank you! TBWATW, very delicious. I agree about Taste! Definitely worth visiting the restaurant to try Tristan's food properly!